In 1968, just eight years after the first human received a pacemaker, the first pup received one of these life saving devices in an historic surgery performed by James W. Buchanan, at the School of Veterinary Medicine, University of Pennsylvania. It is estimated that over 300-400 dogs receive pacemakers every year for applicable heart conditions, even though about 4000 dogs are in need. Read more about pacemakers for pups, why they need them, how they get them, and how you can help. Photo courtesy of Texas A&M University. There are no pacemakers made specifically for veterinary use. 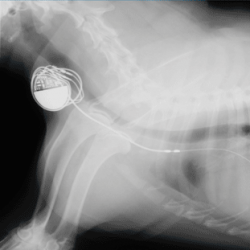 Devices used by veterinarians are either units with good battery life that have been donated by human patients following their death, or are units provided at no cost by manufacturing companies after the pacemakers' shelf expiration date has passed. "Pacemakers in dogs correct the same abnormalities as they do in people," according to Alan Spier, assistant professor of veterinary cardiology, University of Missouri-Columbia (MU). "We receive many phone calls from people with pacemakers, or their family members, expressing desire to donate the pacemakers after the individual's death. Many people feel strongly that this is an important gesture." A giving ending and a new beginning! Giving was important, to Dorothea Edwards. Throughout her life she gave of herself in many ways, including spending 35 years as a faculty member at the College of Family and Consumer Sciences. Before 80-year-old Dorothea Edwards passed on February 4, 2002, she instructed her family to give her pacemaker to a patient who needed it. After Edwards' death, her family learned that federal regulations prohibit person-to-person donations of pacemakers. So the family provided instructions to the funeral home for removal of the pacemaker and found another way to carry out her wishes. The pacemaker was given to the University of Georgia's College of Veterinary Medicine. "We thought this was a great thing to do," says Edwards' daughter, Mahla Swinford. "This is a way she's been able to draw attention to a need that a lot of people didn't know existed and to, hopefully, encourage others to donate." At about the same time, Sunshine, a 9 1/2 year old German Shepherd dog of dubious ancestry, needed a replacement pacemaker to keep her alive. Sunshine's story starts with her owners who were busted for a drug and prostitution ring. Needless to say Sunshine needed a home; and neighbors Cindy and John Wren were up to the task. In 1998, Sunshine became very listless, lost her appetite and began fainting frequently. Medical examinations revealed that she had a congenital heart defect and required a pacemaker to be surgically implanted. After some touch and go moments, she eventually pulled through the crisis with a new, electronically-enhanced ticker. About a year later, Sunshine suffered complications and it was found that she needed a replacement pacemaker. Enter Dorthea Edwards. On March 1, 2002, Sunshine received Dorthea's donated pacemaker and the surgery was deemed a success! 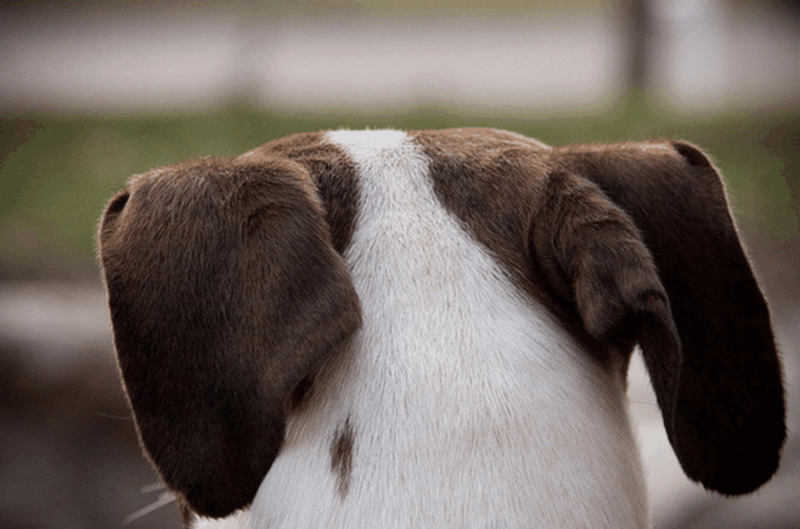 Learn about pacemakers for dogs! Learn more about pacemakers for dogs! How a dog's heart works. 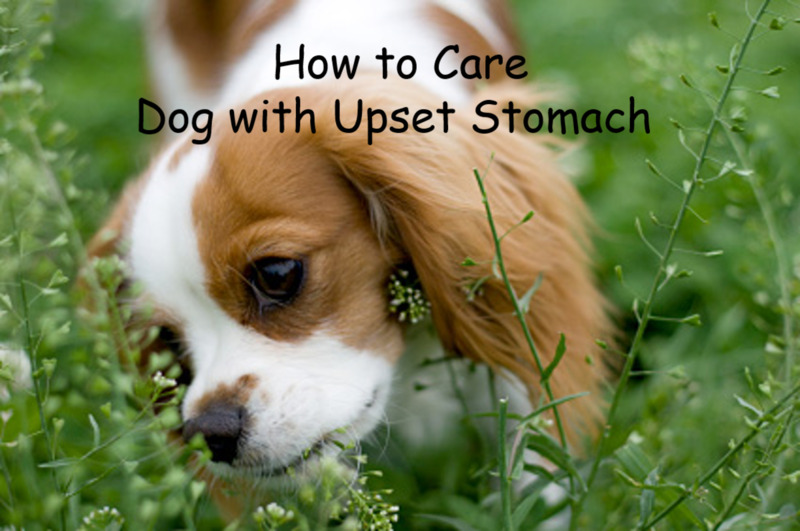 Learn more about how the canine heart operates! Pacemakers for dogs - how it works! Putting a pacemaker in a dog may sound high-tech and far-fetched, but the practice is neither as uncommon nor as costly as you might think. Find a canine cardiologist near you! Link to the American College of Veterinary Internal Medicine - search function for Board Certified veterinary cardiologists. John Alexander Hopps - inventor of the pacemaker! John Alexander "Jack" Hopps (1919 - November 24, 1998) is the Canadian inventor of the world's first artificial pacemaker and is known as the "father of biomedical engineering in Canada". Pacemakers in dogs are used to treat the same bradycardic and tachycardic symptoms as in humans caused by blockage of the heart. Learn more about pacemakers for dogs. Cardio related books on Amazon! More great pacemaker success stories! The full story of Blaze. Blaze, the 4-year-old German shepherd police dog who collapsed on the job at Rikers Island after his heart suddenly stopped, is miraculously back on the beat after doctors implanted a lifesaving pacemaker made for humans. US Customs Canine back on the job! US Customs Canine, Dik, is back on the job in Brownsville, Texas, after receiving a pacemaker to help regulate his heart rate after being diagnosed with Cardiomyopathy. Missy deemed fully cured after receiving dual chamber pacemaker. This lens is brought to you by JohannTheDog.com! JohannTheDog.com - where you can shop for cool stuff for cool dogs. 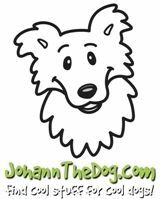 JohannTheDog.com has put together, in one place, all the cool stuff you need for your dog. Find dog beds, all natural foods and treats, collars, leashes, charms, training and agility gear, vitamins and supplements, books, clothing, toys, crates, dog seat belts, t-shirts and other cool stuff for two and four-leggers! And the best part is they donate 10% of their profits to dog shelters and rescues! @anonymous: Tehya had her pacemaker done 2/14/12 at the University of Missouri at Columbia (Missou). They were awesome there! She is doing extremely well and now has more energy than she ever had. Prayers and best wishes for your pup. I think you will be more than happy with the results. The hardest part was trying to keep her confined and stop her from running and jumping during her recuperation period. Tehya felt so much better a week after her surgery that she just wanted to play! @anonymous: That is so pawsome! @anonymous: Sending you lots and lots of doggie wishes all goes well! My dog who is 2 was diagnosed with AV Node Block too. He's getting the pacemaker Tuesday! Hoping all goes well and he stays strong until then. my dog Tehya is a 6 year old Staffordshire Terrier. She was diagnosed with AV Node Block in December 2011 and received her pacemaker on Valentine's Day 2012. She had a super quick recovery and is doing wonderfully. Thanks so much to Dr Clay, Dr Fine and all of the wonderful people at University of Missouri Veterinary Medicine Teaching Hospital. You saved my dogs life and I will always remember your kindness. Wow! This is amazing, I had no idea. Thanks for this informative lens!!! pacemaker in a dog,that amazing. Does anyone know a good veternarian that performs pacemaker implants for dogs in the Seattle area? [in reply to Pj] There are several organizations I have heard about that you can contact to seek assistance and help in paying your pet's veterinary bills. Here are two links to pages that list those organizations. I hope you find the help you need! My dog has developed a serious heart condition that requires a pacemaker and I'm trying to find out how I can get a donated one since I'm on a disability retirement myself. Zodie has exhausted getting success with various medications prescribed. I have no children just my dog and cat and like any pet lover, mine mean the world to me as well. My last dog Ten (cockapoo) and Kiszee (himalayan) were both rescues from the "Dumb Friends League" in Colorado and the dog lived to be 19 and my cat 22. Zodie my is 14 and in good health except for her heart. She has never even had to have her teeth cleaned professionally, just by me. My cat is a Javanese and 9 years old. Any information where I might obtain a pace maker donated as soon as possible would be so greatly appreciated. Thanks to all in advance. My little Pekingese named Peking just had a pacemaker put in three days ago at a wonderful clinic in Lawndale, Ca. called Advanced Veterinary Care Center. His doctor was great and explained everything to me and I knew he was in great hands. Her name is Sarah Zimmerman, and she saved his life. I am so grateful that I can have my precious dog with me longer, he means everything to me. This is a wonderful resource. I wish I had known a year or two, that they did this sort of surgery on dogs.